Butterflies are now sold out for 2018. You may still place orders in advance for 2019 if you have an event in mind: our season in 2019 will run from May 31-September 1 for live release events. Please be aware that butterflies releases are strictly seasonal. We believe in the ethical treatment of our animals from the moment they hatch to the end of their lives, and as such we only offer live butterfly releases when it is seasonally appropriate, in warm summer months. Butterflies need plenty of nectar-bearing flowers as a food source to survive, and suitable temperatures in both the day and night. We usually begin offering butterflies at the end of May in Canada, and we close releases on September 1 (weather pending).We request that you take weather and local conditions into consideration; because these are live insects, and have needs of their own. 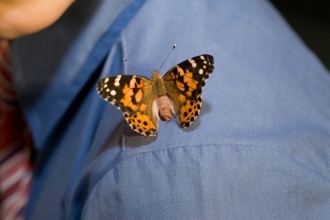 The event: A butterfly release is a unique and memorable way to celebrate a special occasion. Butterflies have long been a symbol of celebrating new beginnings, transition, and renewed hope for the future. Our Painted lady butterflies will become a treasured part of your memories, whatever they may be. They are a touching and appropriate way to honour the memory of a lost loved one; and as symbols of renewal and new beginnings; they are a wonderful way to celebrate change and hope for the future, such as at a wedding, anniversary, or graduation. We exclusively work with the Painted Lady butterfly (Vanessa cardui), and do not offer Monarchs from our Edmonton laboratory as they are not commonly native here. Painted ladies, on the other hand, have qidespread host and nectar plants across Canada, and are very reslient to our unpredictable northern conditions. Shipping: All butterflies are shipped in individual release boxes for their safety and well-being: we do not offer group release boxes. These will be placed inside an insulated shipping container, with an ice pack to keep them cool, and will be sent priority overnight to your destination. These dark, quiet conditions ensure the butterflies rest, as they would on a cold dark Canadian night. When your butterflies arrive, simply remove the ice pack and re-freeze if needed, and store your bugs at temperatures between 4 and 15 degrees celsius until the time of release. BEFORE YOU ORDER ONLINE: we usually require a 2-3 week lead time on all orders over 12 butterflies. Of course, life does not allow us to plan for many events: so we make it a priority to always have a few extra butterflies on hand for these types of occasions. As such, we cannot always guarantee availability. If you are planning a wedding or a big event, please give us at least a month's notice, as otherwise we may not be able to help you. If your event is short notice, please call us directly at 780-462-1839 to inquire about availability. Price breaks are offered as quantities increase. ***Minimum of 6 butterflies per order. *Please ensure you are selecting the correct "size" price for the quantity you would like to purchase. Incorrectly priced orders will NOT be processed. For orders of under 12 butterflies: select size "Small"
Orders of 12-23 butterflies: select size "Medium"
Orders of 24 or more butterflies: select size "Large"
Butterfly Wings n' Wishes reserves the right to review all orders placed. Incorrectly calculated orders will not be processed and you will receive a refund of your purchase amount.